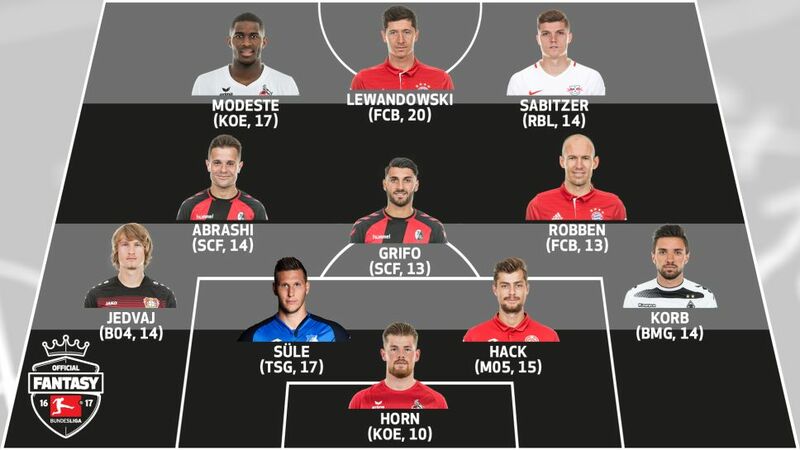 Seven goals shared by a prolific front three translated into pure Official Fantasy Bundesliga gold on Matchday 9, but who else scored highly enough to earn a place in the #BLFantasy Team of the Week? Still not got a team? What are you waiting for! Sign up for Official Fantasy Bundesliga here. Amir Abrashi (SC Freiburg, 14 points) - Matchday 9's highest-scoring Fantasy midfielder, Abrashi's tenacious tackling ability (six points) and first Bundesliga goal (four points) propelled Freiburg to a 3-1 victory at SV Werder Bremen's Weser Stadium. Vincenzo Grifo (SC Freiburg, 13 points) - Scored his second goal of the season and picked up four points for challenges won. Arjen Robben (FC Bayern München, 13 points) - Won two of his attempted challenges, laid on the opening goal for Robert Lewandowski and got on the scoresheet himself in a routine 3-1 win away to FC Augsburg. Anthony Modeste (1. FC Köln, 17 points) - Lost five points for missing a first-half penalty, but roared back after the restart with all three of Köln's goals against Hamburg. Marcel Sabitzer (RB Leipzig, 14 points) - Did not start the game, but grabbed a brace as RB Leipzig extended their unbeaten run to nine matches with victory over SV Darmstadt 98. Robert Lewandowski (FC Bayern München, 20 points) - Scored twice from three attempts on goal, chalked up an assist and picked up four points for challenges won.